Using natural stone as a design element has become very popular in recent years. Why? Well there are a few reasons, actually. A natural stone fireplace just gives off a warm and inviting ambience. Natural stone also gives your fireplace a very distinct look. It can also actually help retain heat from the fire. Another advantage of natural stone is it can be easily customized. There is a wide variety of colors and patterns to choose from, to make your fireplace as unique as your personal taste is. As you can probably guess, stone is also extremely durable. If you have it installed correctly, your stone fireplace will require little to no maintenance for as long as you live in your home. 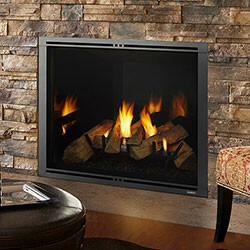 Ask your installer for the best methods to clean your stone fireplace. Having a natural stone fireplace can also help increase the value of your home if you ever put it on the market. And because stone never goes out of style, you’ll never have to worry about your fireplace looking aged at all.